On our way home to Metro Detroit from our recent trip to Traverse City, we could have come back the way we came, but we wanted to see something new. 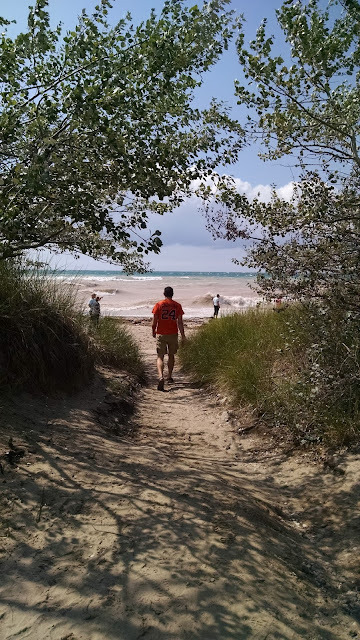 For my wife, it was her first time seeing Lake Michigan from the Michigan side of the lake. For me, it was a a stretch of highway that I had never driven before. Instead of heading south or east from Traverse City, we headed west on M-72 towards Lake Michigan. It rained on and off along M-72, but the rolling hills along the road made the drive entertaining. In the village of Empire, we connected with M-22 and headed south. 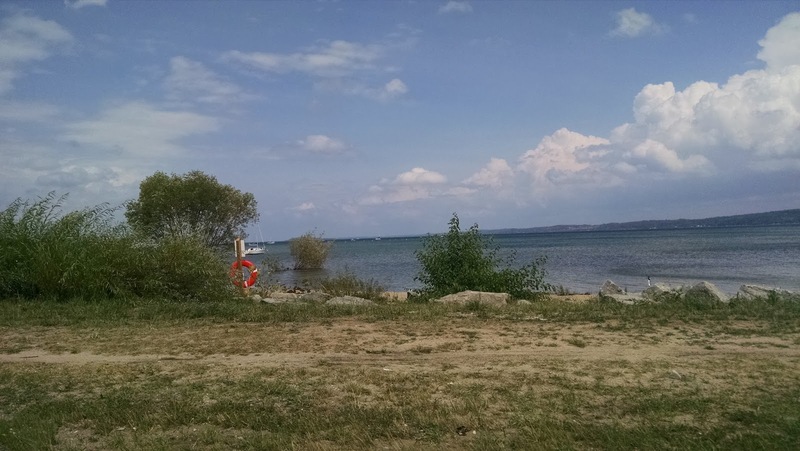 M-22 is a 116-mile-long highway along the shores of Grand Traverse Bay and Lake Michigan. 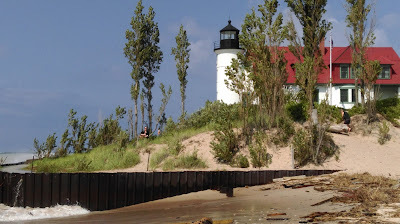 From its eastern terminus in Traverse City, M-22 heads north along the bay towards the tip of the Leelanau Peninsula before the highway turns south and west along Lake Michigan's Sleeping Bear Dunes National Lakeshore towards its western terminus, just north of Manistee. We missed out on the Leelanau Peninsula portion of the highway, but the stretch from Empire to the western terminus was one of the most relaxing drives I've experienced. The highway is mostly lined by forest, but every bend brought the possibility of blue waters. Crystal Lake was stunning, even with the wind kicking up whitecaps. Until this week, I had never been to Traverse City before. When I was growing up, my family always vacationed in the U.P. during the summer. 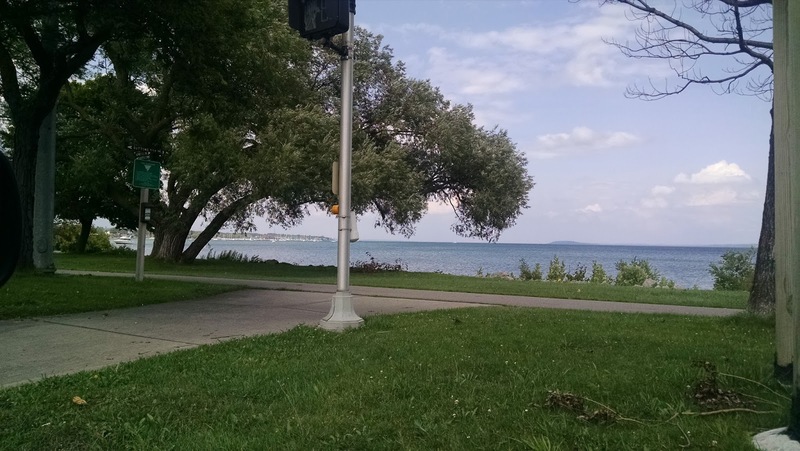 Luckily, I had an opportunity to visit Traverse City for one night, and my wife was able to join me. Unfortunately, our visit was for less than 24 hours, and, after factoring in sleep, we only had seven or eight hours to explore. With such a short schedule, we limited our exploration to an area within walking distance of our downtown hotel and limited our activities to walking, eating, and drinking. Plus, after a rain-soaked drive from Metro Detroit, neither one of us wanted to spend more time in the car. 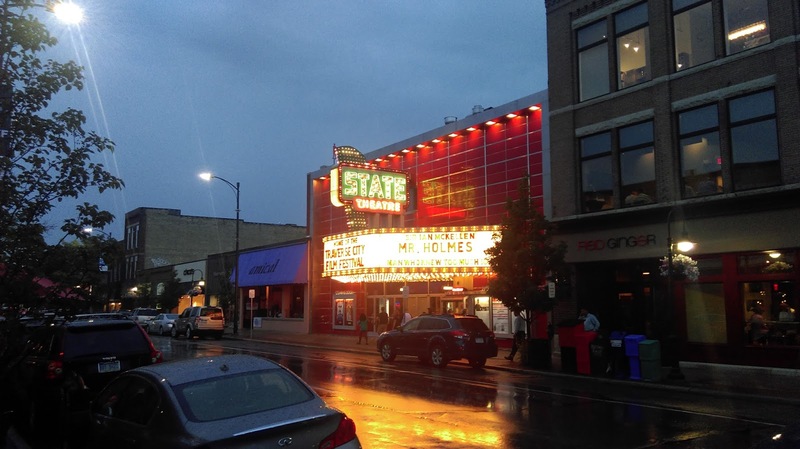 Midway through the night, I dubbed our series of quick stops the "Tour de Traverse City." We stayed at the Park Place Hotel, which is in the heart of Traverse City. We arrived around 4 p.m. and were fortunate that the monsoon that had plagued the last hour of our drive stopped when we reached the hotel. 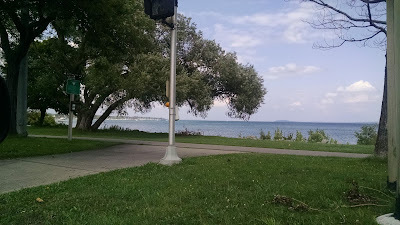 Knowing that the rain would return, we moved quickly and walked toward the shore of the Grand Traverse Bay. As we walked toward the bay, we crossed the Boardman River, a small tree-lined river whose shorelines were filled with docked boats. One tree juts out so far into the river that it must take some serious maneuvering to get around and under the tree without dinging one of the docked boats or banging your head on a branch. A walking path runs along the bank of the river, but we continued on to the bay. After crossing the river, we crossed the Grandview Parkway, whose name is fitting. The skies were still overcast, but the view of Grand Traverse Bay was stunning. Though there are houses dotting the shores of the bay, the hilly shorelines surrounding the bay are covered with trees, making the bay seem pleasantly undeveloped. We walked along the trail in Clinch Park and watched a few people swimming from the beach. Though the trail runs for several miles, we did not walk far since we had skipped lunch and were excited to try a few restaurants that friends and family had recommended. With the trendy downtowns of nearby Birmingham, Ferndale, and Royal Oak dotting Oakland County's Woodward Corridor, it might be easy for visitors to miss out on a small city of only 2.62 square miles like Berkley. 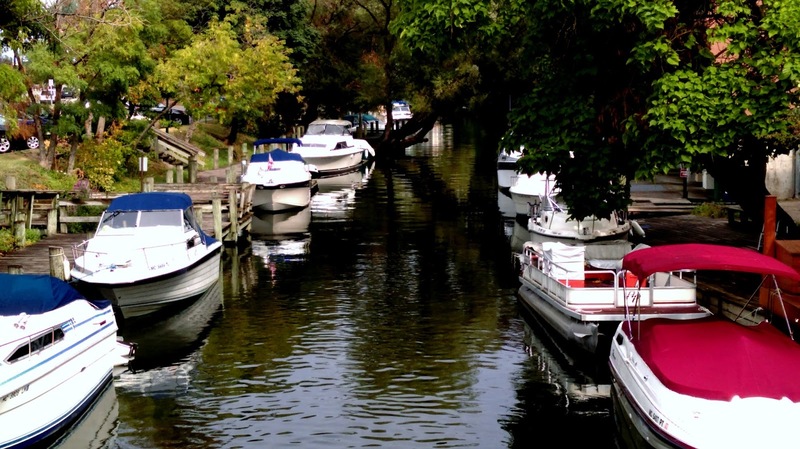 Though smaller than these other cities, Berkley has a lot to offer. 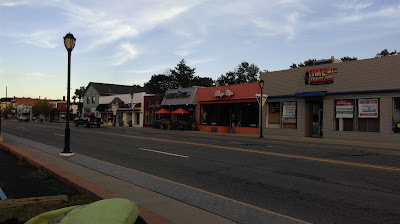 The city is full of walkable and family-friendly neighborhoods. Berkley's downtown has several interesting shops, but I always visit for the food. I have never left Berkley disappointed, or hungry (Seriously, this little city has Vinsetta Garage, Republica, and Mr. Kabob within its borders!). 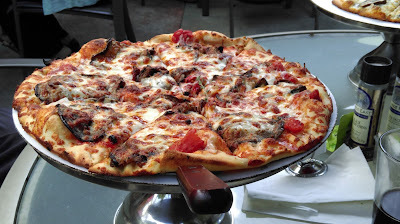 On my most recent visit, I tried Amici's Pizza for the first time. Though I am one of the biggest advocates for Detroit-style pizza, sometimes I need a good traditional round pizza. Amici's feels like three distinct restaurants in one location. Upon first entering from 12 Mile Road, I found myself in Amici's Kitchen, where diners can pick up a pizza to go or sit at a couple of small tables. The Kitchen feels like an old-school pizza parlor where you can watch master pizza makers work behind the counter. Next door through a small door is Amici's Living Room. The Living Room has a bar and several tables, and it feels more like a traditional sit-down restaurant. At the rear of the Living Room is the Patio, a beautiful outdoor seating area where my family and I decided to eat, since it was a perfect summer night. Before I get to the pizza, I need to mention the breadsticks. Amici's breadsticks are thick, almost like pizza crust, and they are lightly covered with Amici's pesto sauce and are served with a side of tomato sauce. Not only are they delicious, but they also made it easier to watch other tables get their pizzas while we waited for our two pizzas to bake. When our pizzas arrived at our table, it was clear we had made the right choice to dine at Amici's that night. The Portabella Mushroom Pizza has a garlic spread instead of traditional tomato sauce, and it is topped with fontina cheese, portabella mushrooms, roasted garlic cloves, and bacon. My youngest daughter normally prefers pizza with tomato sauce, but she devoured the Portabella Mushroom Pizza. Our second pizza was the Roasted Eggplant Pizza, which is topped with mozzarella cheese, tomato sauce, sun-dried tomatoes, and roasted eggplant. Everything tasted fresh, and though the portabella pizza was delicious, the tomato sauce gave the eggplant pizza a slight edge for me. The only disappointment of the night was that my wife and I forgot to take four slices that were left over. I am still regretting that mistake. 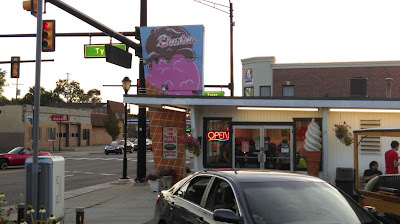 After dinner, we crossed the street to Clark's Ice Cream & Yogurt. Any good downtown area needs an ice cream shop, especially on a summer night. 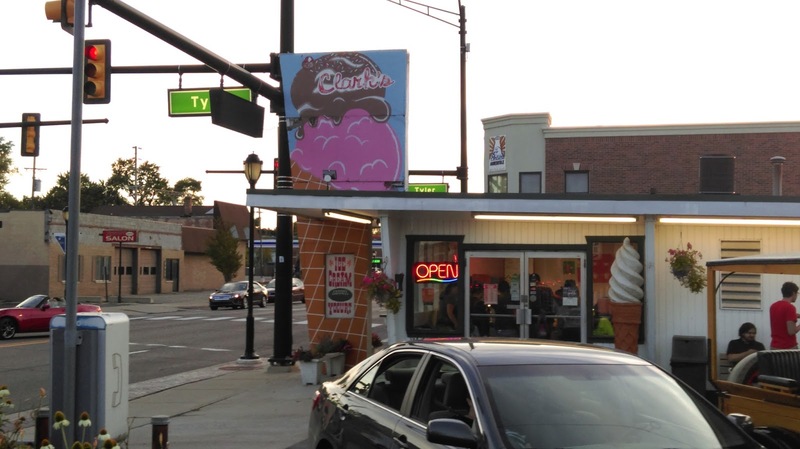 The real delight of Clark's is the grassy area with picnic tables, where you can watch the traffic on 12 Mile while eating really good ice cream on a beautiful Michigan summer night. With a stomach full of breadsticks, pizza, and ice cream, I once again left Berkley without any disappointment. Trust me. Visit Berkley, You'll be glad you did.